Firstly, a huge thank you to everyone who has contributed to our crowdfunder. Thanks to you we were able to pay for our web hosting, buy a first aid kit, and sort out a few other things that we’ve desperately been needing. If you haven’t given yet and would like to- even £5 gives us a hand- you can donate through our Go Fund Me Page. We official opened on 15th May and it was all hands on deck to get the place spruced up in time. One big improvement has been our living room, which was a sad salmon coloured space with no flow and too much furniture. With a lick of white paint (rescued from Aberystwyth dump), and an afternoon spent moving furniture around like one of those sliding puzzles, we’ve made a functional dining room with plenty of room for guests to eat, and a cosy living room space. Out in the Noddfa Dawel garden baby steps have been taken towards the semi-edible cottage garden of our dreams. While the buttercup lawn we’re mulching over is beautiful, we’re replacing it with gorgeous flowing no dig beds that will support a mixture of pollinator friendly flowers and herbs for the table, so the overall result will be more biodiversity. 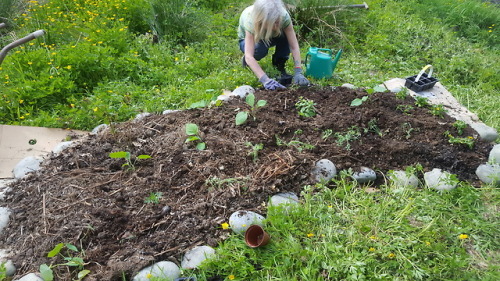 Our first guest lends a hand planting in the start of the Noddfa Dawel garden. And finally, the Noddfa Dawel hotline is up and running! We’re on the Giffgaff network and you can reach us on 07724685897. Only the finest cutting edge technology is good enough for us. Wow, it feels like only yesterday I was moving in to the unloved shell of Noddfa Dawel, and now we’re nearly ready to open! We’ll be taking bookings for retreats from 15th May. In the mean time- can you help us out with funding? We’re raising cash to help with set up and as a pool of available funds for those who can’t afford full price retreat. We’d love to raise £3,000 but any donation is greatly appreciated. Click here to see our fundraising page! Well, I’m off to enjoy the spring sunshine and sow some more seeds. Here’s to a beautiful year for Noddfa Dawel. Hope to see you on retreat soon.